My TDS deduction is more than the sum of the total Tax and penalty amount for late filing of ITR 1. Do I still need to pay the challan of Rs.1000 separately against the penalty? Hello Sir, thanks for your tutorials that made us possible to file ITR through our self. With your tutorial video's I successfully filled my father ITR before due date. Now I was given to file ITR on behalf of my father colleagues & Relatives after the due date & they are entitle to pay the late fees. After filing ITR details of one person I stuck at middle of something which I didn't find in your tutorials or others as I'm new for the late payment procedure for filing ITR after due date. Case 1: Penalty Payment Code Selection. Q1. Which penalty payment code I have to select from 11c or N11c as I'm paying late fees? Case 2: I e-pay the late fee amount one of the taxpayer with my own SBI debit card and transaction was successful and I filed ITR and e-verified it. After waiting sometime I didn't get any debit msg from bank so I called up Income tax helpline to clear my doubts and they said "The tax payer have use own debit card or net banking to pay his own tax amount, we cannot allow other person bank payment to pay such tax as both have different PAN No. which cannot help us to verify tax payer. Please revised the ITR with new late fee payment through Tax payer bank account and stop the transaction which you made payment through your debit card earlier at bank branch." So I Revised the ITR with tax payer debit card and successfully e-verified. Now I called up SBI bank helpline to claim or refund my own amount which i paid with my own debit card and they said it cannot be cancel now, the amount was already transfer to NDSL account. Then I called NDSL helpline they said we can't help you or cancel it, please contact income tax helpline or AO of your area and complain it. Now I'm not able to find Contact no of AO anywhere as Sunday is holiday for ITR helplines. So I mistakenly paid the ITR late fee amount of one Taxpayer of Rs.1000/- twice with his debit card and also with my own debit card. A total of Rs.2000. Q2. What I do now to get my 1000 amount back and in how many days I get it? Q3. Do I have to wait to show both the late fee amount to show up in Form 26AS before Revised Filing and then claim in self assessment tax section? Q4. Is it true that tax payer cannot use other person bank debit card or net banking to pay his own late payment fees? Please suggest me the appropriate procedure of filing Revised return to duly correct all my mistake and confusions. Many thanks in advance for finding solutions of my questions & queries. As it also help others to avoid any mistake in this belated period. Thanks Sir, What Penalty payment code should I select from (11c or N11c) at the time of making payment. Can you tell me. A taxable payer income less than Rs 250000 lakh. He want to ITR 1 file for FY 17-18. 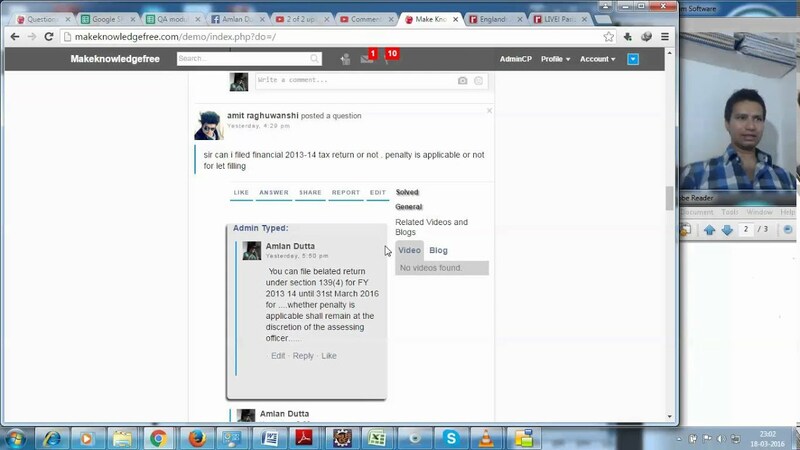 He will file return after due date, then penalty is applicable or not?